Our high speed KURT is a modified version of a standard KURT2 . KURT is a German acronym for experimental robot platform for sewerage inspection. It is the prototype of a wireless autonomous mobile robot, with a size of 45 cm (length) x 33 cm (width) x 26 cm (hight) and a weight if 10.4 kg. It is equipped with a Panasonic tough-book (+4.2 kg, 800 MHz pentium 3) and a 3D laser range finder (based on a Sick LMS, +7.0 kg) that increases the height to 47 cm and the weight to totally 22.6 kg. For indoor environements the front and rear wheels have no tread pattern to enhance rotating. KURT2 operates for about 4 hours with one battery charge (28 NiMH cells, capacity: 4500 mAh). The core of the robot is a Pentium-III-600 MHz with 384 MB RAM and Real-Time Linux. An embedded 16-Bit CMOS microcontroller is used to control the motor and lower sensors (Phytec. Minimodul C167, inc. flash rom). It's current maximum velocity that we can control with our robot control architecture and the laser range finder (about 70 scans/sec, 181 values in 180 degrees) is 4.0 m/s (14.4 km/h) and is reached by two 90 Watt Maxon motors (transmission 1:14) . KURT2 drives in the corridors of campus Birlinghoven. The following short videos (encoded with divx), show the robot in action as well as the view from it's cameras. Kurt drives with 3.5 m/s (7.9MB). Video without robot view. Kurt drives with 3.5 m/s & stops for a dynamic obstacle (6.9MB). 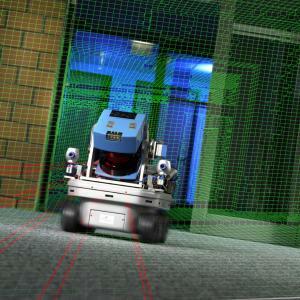 Kurt drives with 3.5 m/s - View of the robot and through a camera mounted on top of the laser range finder (48.5MB). Localization of Kurt in the corridor (13.0 MB). Video displaying the one critical situation (featureless environment while turning in a corner) for tracking. Localization of Kurt while skidding on smooth surface (18.6 MB). Localization & 3D map building outside (31.1 MB).